Does PG&E’s bankruptcy mean that I no longer have a claim? If I make a claim against PG&E, will that cause my rates to go up? Does PG&E’s bankruptcy affect the deadlines for filing a claim related to the Camp Fire? As has been widely reported, PG&E filed bankruptcy this past week. This will be the largest bankruptcy in California and likely the nation. With this bankruptcy come many questions. Although we do not know all of the answers at the present time, we do know one thing . . . IF YOU HAVE SUFFERED A LOSS BECAUSE OF THE CAMP FIRE, YOU HAVE A VIABLE AND VALUABLE CLAIM. 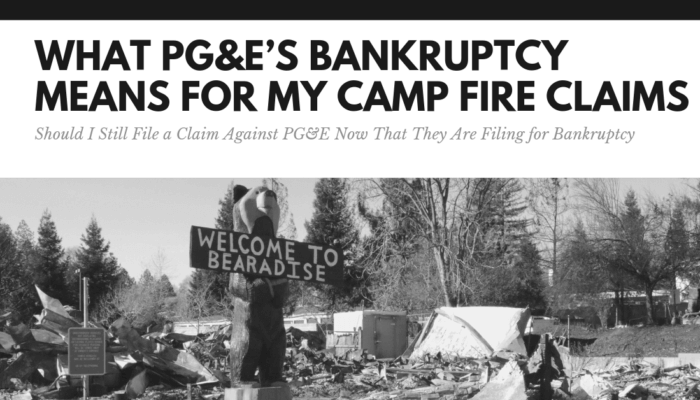 The only thing that has changed with PG&E’s bankruptcy is where the claim will be heard (i.e. California Superior Court or United States Bankruptcy Court). Camp Fire claims will not be heard in the United States Bankruptcy Court. We are concerned that many who learned of PG&E’s recent bankruptcy filing will decide not to seek recovery from PG&E for their losses related to the Camp Fire feeling that all is lost. Or, worse yet, some may feel that they are somehow adding to the problem by filing a claim. Notwithstanding these concerns, the bigger issue is that the time for filing claims is going to be shortened because of PG&E’s bankruptcy. We anticipate that the bankruptcy court will likely issue an order relatively soon setting strict deadlines as to when Camp Fire claims must be filed in the bankruptcy court. As such, time is of the essence. If you know anyone who is having such thoughts, please give them our numbers so that we can talk with them and help answer their questions. If you have any questions about how PG&E’s bankruptcy might affect your claim, please call us. If you know of anyone who has not yet hired an attorney to pursue a claim, please share our contact information with them. Please come and discuss your questions in person and bring your friends and neighbors with you so that we can help them as well.